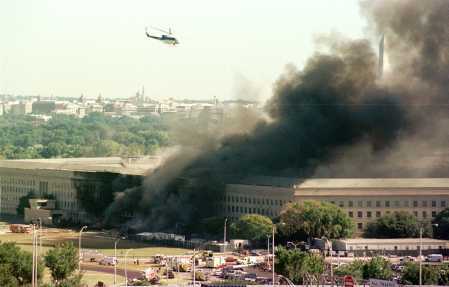 A helicopter flies over the burning Pentagon Tuesday, September 11, 2001, 4: 55 PM, in Arlington, VA. The Washington Monument can be seen at right, through the smoke. The White House roof is visible in the trees of Washington at right. "A group of my friends and carpool passengers (also friends) walked home from the Natural History Museum yesterday noon, across the 14th Street bridge and around the burning Pentagon. 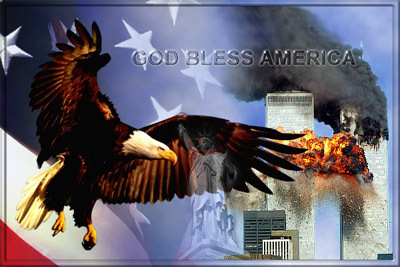 We're shaken, but not stopped... We're Americans..."
"September 11, 2001 will be placed among America's most infamous days. 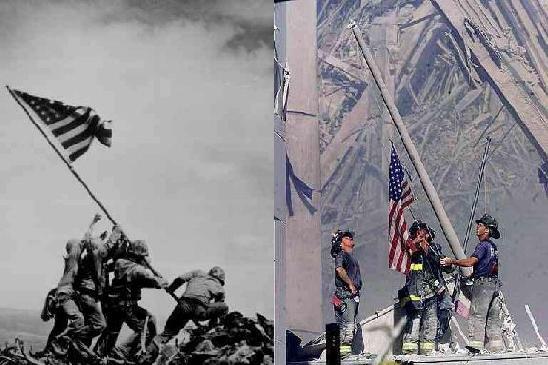 The fabric of our great Nation, though tattered, is not torn beyond repair. Old Glory is bowed now in mourning, but still flies proudly from sea to sea. From the ashes we will rebuild. Out of our sorrow will arise great anger, and we will track down and destroy the perpetrators of America's greatest sadness. 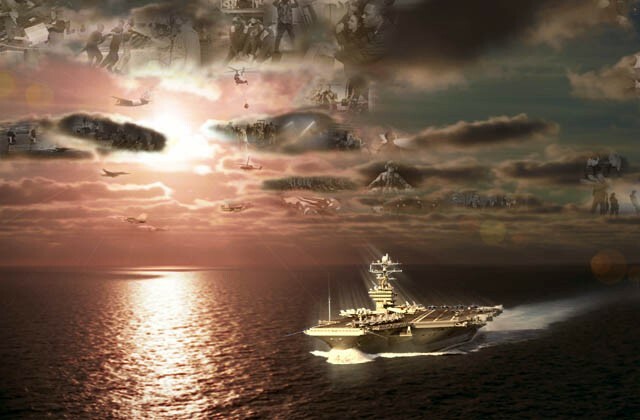 On Friday the 14th we chose to reflect and remember, but the insufferable bastards who brought their evil to our shores will never, never forget!" 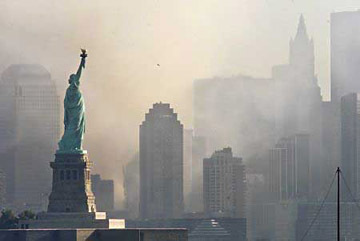 September 11, 2002 is soon approaching. worked to save them and the families left behind. Please spread this word to your friends and family. have read this and will join together in unity. Please join us on 9/11! to drive with their headlights on during daylight hours. our men and women of the Armed Forces. 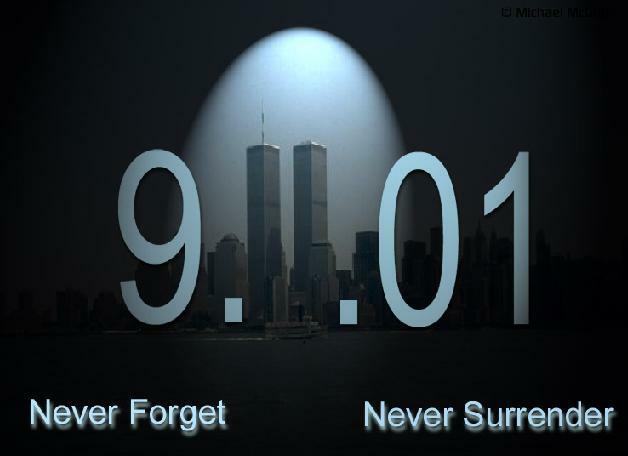 Remember --- 9/11 LIGHTS ON! NOW YOU CAN'T SAY YOU DIDN'T GET THE MEMO!!!!! Many souls were lost but our spirits were found. It is now one year since the tragic incidents of September 11th 2001.
faith in the strength and resolve of this great country. The original version of this was written during the summer of 1918 at Camp Upton, located in Yaphank, Long Island, for "Yip, Yip, Yaphank". He never used the song, and it remained tucked away until 1938. In the fall of 1938, Berlin decided to write a song about peace. He recalled his "God Bless America" from twenty years earlier, altered parts to update popular sentiment, and introduced it to the world on November 11, 1938, by Kate Smith. This link was brought to our attention by Joyce Lawrence Cahoon. Thanks, Joyce! This image was suggested by Sandi Bateman Chestnut. Thanks, Sandi!